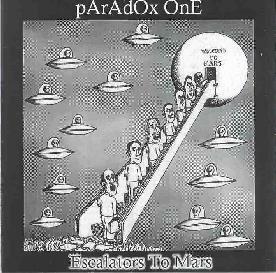 Paradox One - "Escalators To Mars"
Paradox One is a solo project from Scottish musician and progressive rock journalist Phil Jackson. Escalators To Mars is his third CD on Rick Ray's Neurosis label and consists primarily of two lengthy suites. The album opens with the multi-track Escalator To Mars. After a brief bouncy keyboard intro, "Twilight Creeping Across The Continent" shifts gears with multiple layers of atmospherics, bubbling and gurgling spacey bits and pulsating effects. There's also an acoustic guitar buried in the mix playing a noodling melody. It's a cool combination of video game and sci fi soundtrack elements. The theme continues to develop on the darkly intense, marching space-prog tune, "Little Green Men". "Yap! Yap! Yap!" goes deeper into atmospheric and enjoyably freaky alien space territory, though Jackson's keyboards keep things equally in the progressive rock realm. Until now Jackson has been drifting along, slowly putting the pieces of his Martian world into place. But as if the picture were now completed and ready for action, things get really exciting with "Son Of Little Green Men", a killer slab of wailing melody, syncopated synth patterns and a general glom of Kosmiche intensity and fun. Next is "Wake Up Call" which shifts gears in both style and mood, being a peacefully melodic tune driven by keyboard and strumming acoustic guitar. But in the last minute, as if it were a completely different song, a potent Deep Purple styled Hammond kicks in, though this section is all too brief. I recall hearing this Jon Lord keyboard sound on previous Paradox One albums. "Minimum Survival Explorer" is a quirky robotic Martian dance song with a great keyboard sound, a solid groove, and cool efx'd vocals. And "Vignette" brings the suite to a close with soothing acoustic guitar and angelic keyboards. Pretty damn good! Jackson does a great job of thematic development and is, with some minor exceptions, seamless in his transitioning from one track to the next. The album continues with a shorter but still lengthy construction, the 3-part "Angel Song In Neon". Opening with still more space-prog styles, the music is light and melodic at first, but then becomes a brooding song, with the second instance of vocals on the album. I like this song for the nifty blend of progressive rock and Hawkwind influences. And the third part is just as cool, launching into a space-jazz jam that combines steady bubbling space synth patterns with grooving jazz keys. Finally, the album wraps up with the stand alone track, "Milo Mindbender", an acoustic song that's like a cross between folk music and pub rock. In summary, this is the strongest Paradox One album to date. With each new release Jackson becomes more accomplished at developing solid ideas into larger, coherent works. And while there was plenty of both progressive and space rock on his last album, Dimension Of Miracles (see AI #20), Escalator To Mars integrates these musical spheres more fully to create a space-prog blend that will appeal to varied tastes. Check it out. Escalators To Mars is available for $7 payable to Rick Ray and sent to Neurosis Records; 20301 Ball Ave; Euclid, OH 44123.